"What is the Assumption of Mary?" "What is the Assumption of Mary?" The Assumption (from the Latin "Assumptio," meaning "a taking") was defined as Dogma in 1950 by Pope Pius XII. The Church itself interprets Chapter 12 of the Book of Revelation as referring to it. There had been questions about how the Pope would define the Assumption since there seemed to be little in Scripture on it, and what things there were in the Tradition of the Fathers seemed to come not from an apostolic origin, but from some apocryphal stories that circulated starting in the Fourth Century. Although a Pope is not required to specify precisely where in the sources of revelation he finds a given doctrine, those documents often do review various things that seem to support the teaching. We see an example of this in the Papal Bull, "Ineffabilis Deus," in which Pius IX defined the Immaculate Conception. One thought that was clearly in the mind of Pius XII was the principle of consortium—that Mary was "always sharing Christ's lot" (AAS 42. 768). 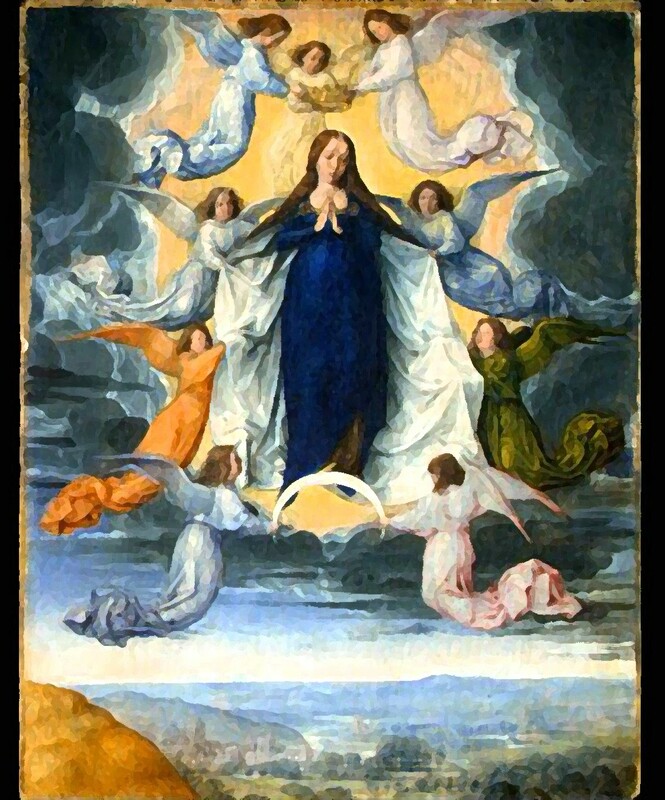 In line with this, Pope Pius showed the relation of the Assumption to the Immaculate Conception: "For these two privileges are most closely related to each other. Christ has overcome sin and death by His own death; and one who is reborn in a heavenly way through baptism has conquered sin and death. However, in accord with His general rule, God does not wish to grant the full effect of victory over death to the just until the end of time... Yet God wished that the Blessed Virgin Mary be exempt from this general law. For she, by a completely singular privilege, conquered sin in her Immaculate Conception, and thus was not liable to that law of corruption of the grave, nor did she have to wait for the end of time for the redemption of her body" (AAS42. 754). Pius XII next said he had asked the opinions of all the bishops of the world on the Assumption. Their response was almost unanimous in the affirmative. The universal teaching of the authorities of the Church, he tells us, gives us proof (Cf. Lumen Gentium, Nos. 25 and 12). He next reviewed some of the outstanding statements of Tradition throughout all the centuries. Teachings on the Assumption are found at a very early date in the liturgical books. He also speaks of St. Francis de Sales, who "after stating that it would be wrong to doubt that Jesus Christ has kept in the most perfect way the divine commandment that children honor their parents, puts this question: 'What son, if he could, would not bring his mother back to life, and take her, after death, into Paradise?'" (AAS 42. 766).The Pope concluded: "All these arguments and considerations of the Holy Fathers rest on the Sacred Writings as their ultimate foundation. These place the revered Mother of God as most closely joined to her Divine Son, and always sharing in His lot. Hence, it seems practically impossible to think of her—who conceived Christ, brought Him forth, held Him in her hands, and pressed Him to her heart—as being separated from Him after this earthly life in body, even though not in soul" (AAS 42. 767-68). Pope Pius first recalled the New Eve theme, which we have seen. Then he focused on the fact, within that theme, that the New Eve had been closely associated with the New Adam in the struggle against sin and death. Still further, in the case of her Son, that struggle had brought glorification. Since the struggle was in common to both, then a common cause would have a common effect: it had to bring a parallel glorification to her, i.e., the Assumption. Pius XII carefully refrained from saying in his own words at any point that she died. Some, even a few of the Fathers, had denied that she ever died, basing this on the fact that death was the result of original sin, which she lacked. However, because, as Pius XII also said, she was "always sharing His lot," it seems much more probable that she did die, just as her Son did before her.